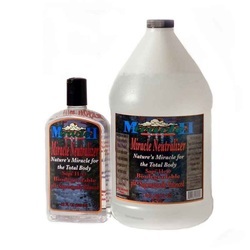 Miracle II Neutralizer - 22 oz. Take internally or use externally on yourself, your pets and your plants too. This liquid is colorless & tasteless, and can be taken alone, with water, or with any beverage. Often used in combination with Miracle II Liquid Soap for powerful detoxifying bath. When taken internally, the Miracle II Neutralizer will remineralize and balance your body. It restores proper functioning at the cellular level, and balances electrolytes in your bloodstream. You will have proper absorption of nutrients for healthy functioning, and this can bring back your health, even from very challenging illnesses. • When sprayed in the nose, it can clear nasal congestion due to colds or allergies, and stop nose bleeds. • Added to a vaporizer it will relieve harsh coughs, bronchitis or croup. • Detoxify yourself by adding to your bath. • End the life of any fungus on finger & toe nails. • Taken as a douche will clear up a yeast infection. • Body odors can be eliminated, not covered up. • Works beautifully as a hair conditioner. In agriculture, crop yields have been improved by over 100%, with enhanced taste & nutrition, and without using any chemical or organic fertilizer. Electrically engineered eloptic energized stabilized oxygenated water, Ash of Dedecyl solution, Calcium, Potassium and Magnesium. Most common use is 15 ml (half ounce) in a bath, together with the same amount of soap. 7 to 10 drops in every glass of water you drink. It is safe even at 1 oz per day. Cleanse & detoxify, clear up yeast & fungus, alkalize internally, and fertilize your house plants, gardens, and field crops.